I have recently adopted a beautiful Cane Corso, My experience with the CCUK&MR has been fantastic. They truly care about re-homing the dogs in the right family and are thorough in their checks whilst being friendly and supportive, this has been invaluable and the advice given extremely helpful. I know I am lucky to have the chance to give a dog a home, especially after the horrible start she had in life. She is now spoilt with cuddles, plenty of walks and her own armchair. Watching her personality grow everyday gives us big smiles, even when she has decided to investigate the contents of my bin bag all over my garden. A big thanks to CCUK&MR for allowing us to give a home to such a bundle of happiness. I met my first Cane Corso puppy last year. I’d never heard of the breed before and my web research led me to this site! I do love a chat!!!!!!! 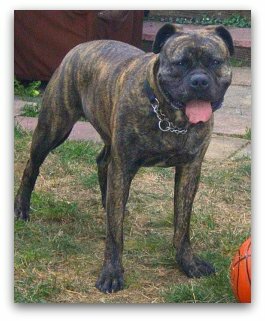 so I joined the forum in the hope of finding a “sister” for my beloved Duke – a great dane x mastiff who we adopted from Battersea in February 2005. I advised the lovely ladies here about my son Gareth and his special needs (he has autism, ADHD, ODD, Bi-polar disorder & many other disorders!) 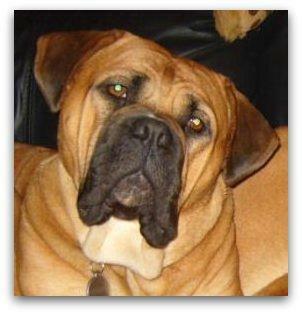 And then they rescued “Chocolate” – a very pretty Bullmastiff girlie who had been bred from (at less than a year old!) and then dumped from the back of a van alongside another pretty girlie who had also been recently bred from. We arranged to meet her – and fell totally head over heels in love with “Ruby” as she is now known. We adopted her November 8th 2008. She is absolutely adorable! She loves Gareth to bits! Duke has accepted her as his sister, and we are all going to live happily ever after. We adopted Hank from Cane Corso UK & Molosser Rescue. We first met him in July and spent a month visiting and walking him before we bought him home as he needed to get to know us properly before coming home. The ladies at the rescue were fantastic with help, support and advice, they do truely put the dogs needs first. Since he has been with us he has made us laugh every day, he has such funny ways about him. He has settled in really well and has become a part of our family like he has always been here. We can’t thank Cane Corso UK & Molosser Rescue enough for our beauitful boy.